Being a new-mom and having to wake up around every 2-3 hours to feed the little one, you can probably guess that my eyes are looking quite tired and my under-eye circles are looking more and more like a panda everyday. I do not necessarily either have the time to obviously go the spa, get pampered or just sleep as long as I want to. Therefore, the only solution is to find a product that could help fight the tired-look and dark circles. This eye mask is gel-like in texture and is cool to the touch and in the application, which means that when I put it on, it already immediately helps with the puffiness. In addition, it is enriched with cucumber extract and various other plant stem cells to help combat dark circles and fatigue. What I also like about this product, besides the cooling sensation, is the fact that it is quick to absorb to the skin and does not leave behind any tackiness or I do not feel it on my skin at all (being a mask as well). It is also worth noting that this product is vegan and formulated without mineral oil, paraffin or petrolatum. 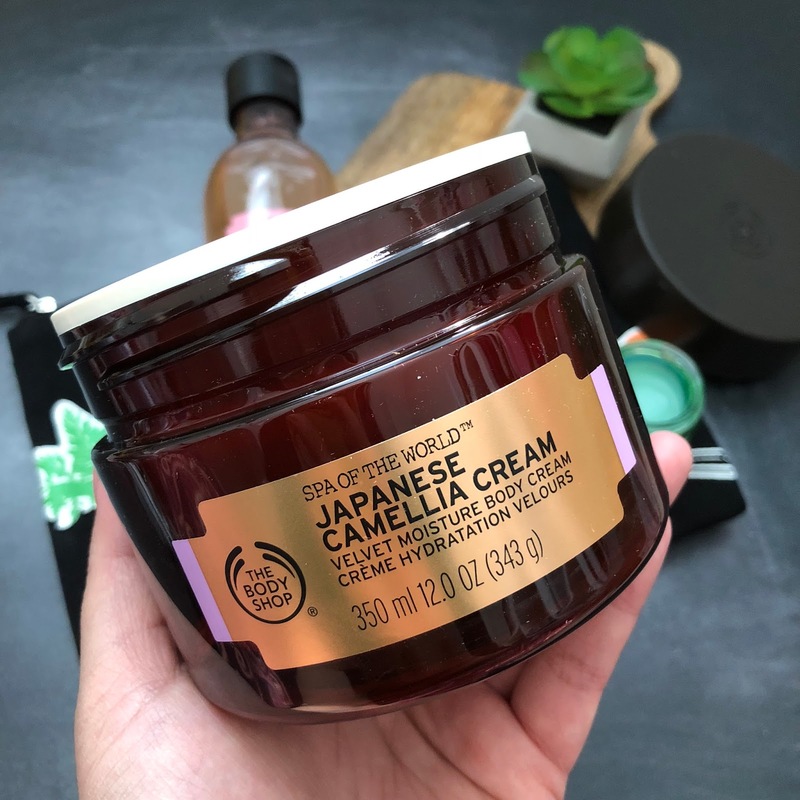 I thoroughly enjoyed this product and would repurchase it in the future. Dry, alligator-like and flakey skin...nobody likes those things and with the past winter, my skin seems to have lost all its moisture. 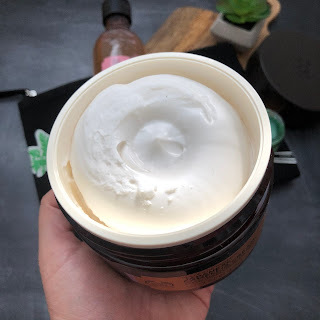 I have always been a fan of the body butters from The Body Shop so I was pretty interested to see what this product would do being that it came in a pretty large tub and is almost whipped in consistency and is light-weight. 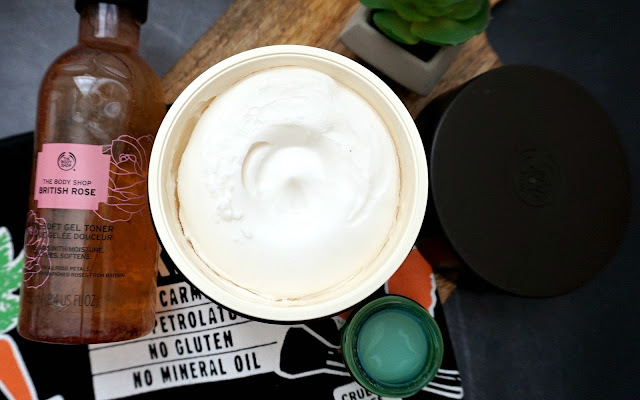 It is quick to absorb which is a great plus and just feels very luxurious on the skin. I really enjoy the texture and formulation of the product, however the scent of it was just a bit strong to me. I prefer more subtle scents and notes - and this was just something I would not gravitate to. Therefore, I would repurchase this in the future, but just in a different scent. As you can see from the image below, the tub is huge and would honestly last you a while! 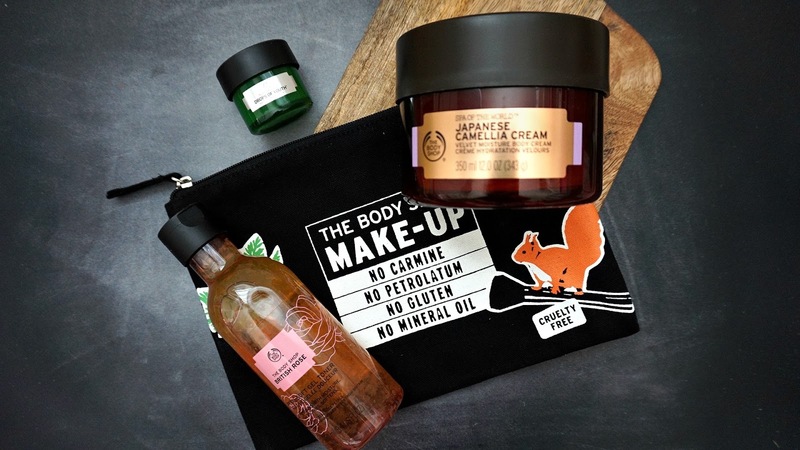 Finding a toner that is alcohol free is hard these days, and to be honest one if you've been a reader of my blog you will know that one of the biggest reasons I shop at The Body Shop is because of their alcohol-free body wash which has been a godsend to me and my eczema-prone skin in the winter time. This toner, is also alcohol-free which means that when used your face will not feel stripped of its moisture and will end up just feeling soft and soothed. This toner is literally infused with real rose petals and the gel-like consistency is from the aloe vera which we all know helps to regenerate and heal the skin. This is also a vegan product! I am normally not a fan of rose-scented products because most of the time it smells very artificial, but this one has the most natural and subtly scented rose fragrance that I really enjoy it and again, would repurchase it in the future!